Rene at one of my favorite blogs, Cottage & Vine has invited me to guest post on my favorite room in the house...I am so thrilled to be included in her "Favorite Room" series. I actually had not even thought about what my favorite room is until I received her email. It took me about two seconds to decide that it's my entryway. Here's what I love about it . . . Both my front door and entry from the garage converge into the same space, so everyone drops their stuff in one spot. Which is actually kind of perfect because you only have to have one space to organize and everyone knows exactly where they can find their backpack, jacket, shoes, keys...whatever it is they are looking for...there's a space designed for it. But first...my entryway begins outside...I adore herringbone so we added the brick, the lighting is by Bevolo as well as the mailbox. Lighting is like the icing on the cake...it has to be perfect. I wrote more about it here. Once inside...this is the first thing you notice. I designed a quarter round shelf just for this lamp. In my old house I had a tiny, but tall black table that was about the same surface size and I had the same lamp by Jamie Young. This little lamp is lit all the time and its 15 watt light bulb welcomes us home. 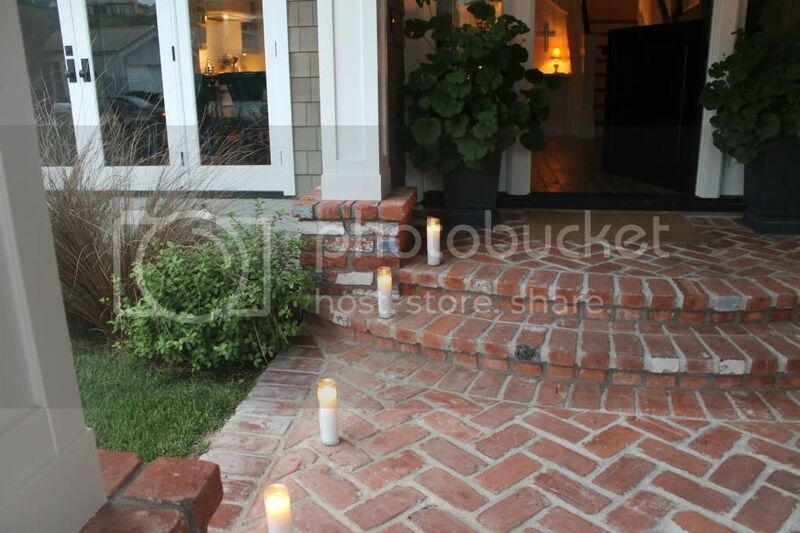 We use white religious candles to line the walkway and the steps whenever we have guests...It always makes people feel welcome. One thing in a small house that is very important is to have a place for everything. I knew we needed a space for cell phones, keys etc. and this little cubby was the perfect solution to avoid having it all end up on the kitchen counter. Our entire interior is pretty much black, white and neutral so it's fun to add a little color with things we are using for the beach, the pool or just going out. 1. Summertime blues and stripes, 2. Black and tan, 3. Yellow and green and 4. Shades of red. Fourth of July is a really big deal in our neighborhood...there's a parade, a bluff BBQ, sand castle contest and our house is on the path that everyone sees...so we have a lot of flags and a lot of red, white and blue. We used to have a beautiful bar set up in our living room all the time. I loved the look of the different bottles and glassware, but in a beach house with kids, it just didn't seem right anymore. This little cabinet is perfect and no one even knows it's there. I didn't even put knobs on the door. This photo was taken last winter when flip flops disappear and Hunter rain boots and jackets take their place. It's probably not a coincidence that all our jackets, sweaters, sweatshirts are in shades of black and gray...it goes with the neutral colors in the house, so anything else ends up on the hooks just outside in the garage. It took my husband about a week to discover that his orange and brown Northface was relegated to the garage hooks...sorry honey. So come on in . . . the door's wide open! Thank you Rene! Wow what a nice house. I love the candle idea, but we have two dogs, so that wouldn't work. If only! What an utterly beautiful home you have and I love your attention to detail with everything that's hanging on the pegs - mine is a shocking mish mash. This is all so very, very elegant and, at the same time completely practical, a combination not always easily achieved. Like you, we love the herringbone brick, absolutely classic, and the small touches such as the welcoming candles to edge and light the stairs. The whole appears so light and airy and, above all, most inviting to guests as well as to yourselves arriving home after an absence. Perfect. Annie I agree with you! Whenever you post a photo of your entryway I just wither with envy. I love how clean and organized it is, and it gets such beautiful soothing light. Can I move into your entryway? I wouldn't take up too much space. Your entry way is such a great size for greeting guests. You have decorated your home with such exquisite taste and attention to detail...I'd love to see it in person. Really it could be in a book or a magazine it is beyond beautiful and I really mean that. I adore your entry! It's so warm and inviting. The brick work is gorgeous and have it in mind for my own walk that needs to be replaced in the next few years. 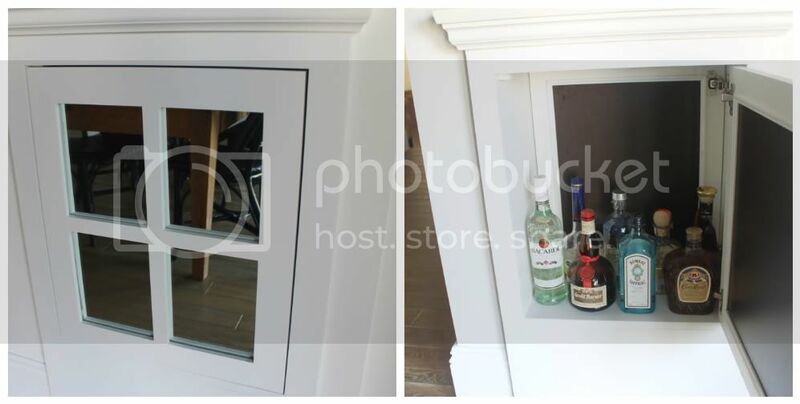 The hidden cabinet for keys and phones is brilliant! I'm sure your guests love being welcomed by the candle lit stairs. I know I would! I love your nook for your cell phone, etc. and I feel the same way about a bar in our home with my little boy. You have such a way with seasonal displays. It's all L O V E ly!! Annie! I absolutely love your design style and I am having total house envy right now! Your house could be in any magazine. 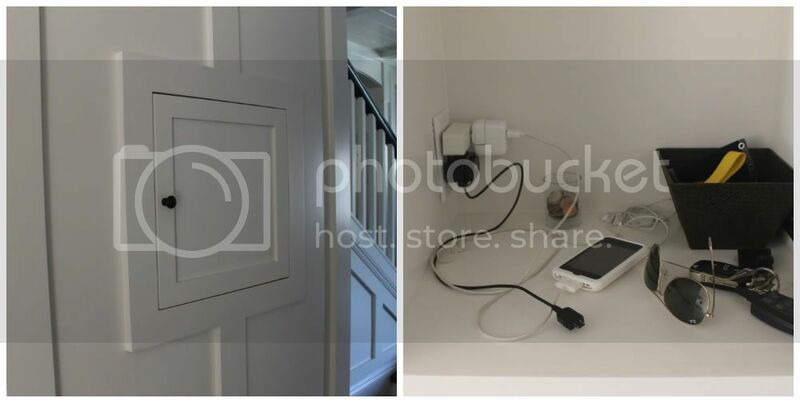 I adore that little closet for keys, phones and sunglasses, genius! I need something like that in my house. I am bookmarking all your great ideas for our next house. Great job! I never get tired of looking at your house and want to steal your idea of the welcome candles. I wish we were neighbors! annie,if i had a newer home i would hope it would look just like this. this is so my style. it is so classic and serene and yet not one bit boring. love it all. I love everything! And I would kill for a secret cubby just like yours, cute and clever! I love that recessed nook....ours would have dog leashes too. Nice place to stash everything! 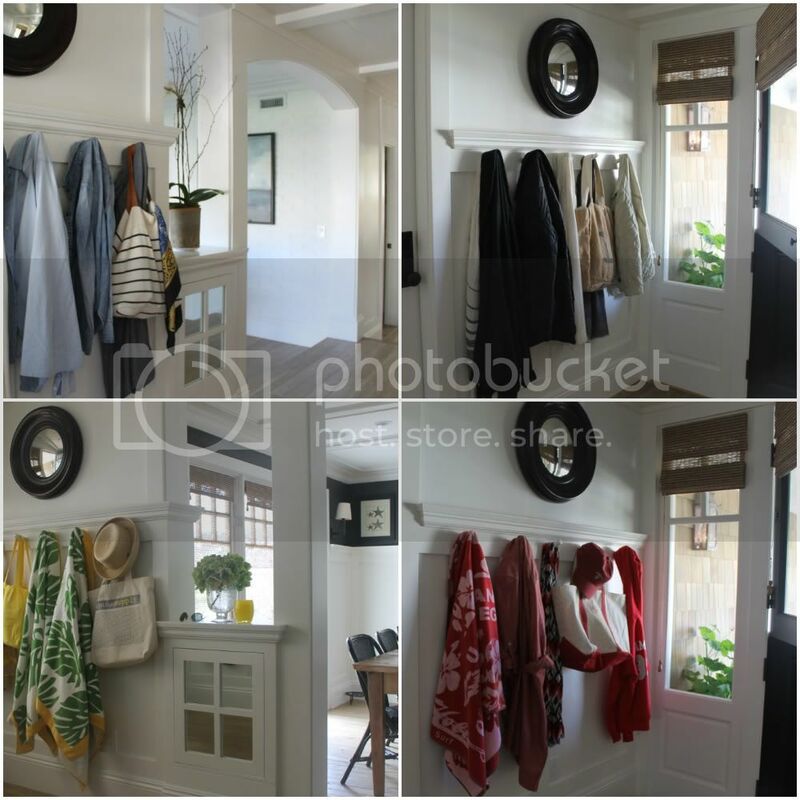 Your beautiful entryway is so welcoming and truly the heart of your home! I love the clean cottage style and all details... jackets, totes and towels, changing with the seasons! I am loving the cubby hole to keep keys, cell phones, charger out of the way. I just pinned that to my "Making Life Easier" folder. Love that you shared your home! You have a beautiful home and I'm sure the entry is just a portion of how welcoming your home is - it's beautiful. I love the brick leading up to the front door and the stairway. Really really pretty - I bet you enjoy it. Thanks for stopping by my blog today.